At Alpha Gifts and Awards we supply a wide range of glass and cut crystal gifts that are ideal for special occasions, be it a wedding gift or some elegant glassware to bring out at Christmas and celebrations! Glass Gifts for All Occasions! Glass blocks engraved with a special message or even an image of someone make a fabulous, thoughtful gift that doesn’t break the bank to purchase, while our range of cut glasses would make a perfect present for whisky, brandy and wine lovers. Our professional engraving service allows you to inscribe any of our crystal and glass gifts with a personalised message that they can treasure forever. Our experienced craftsmen use the latest equipment to ensure the end result is absolutely perfect – as you’d expect it. So if you’re stuck for a gift idea, have a browse of our stunning glass and crystal gifts, each of which can be professionally engraved with a message of your choice. 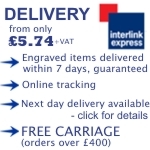 We guarantee delivery within 7 days so even if you’ve left it last minute there’s still time! For more information please feel free to call us on 0800 0355 277.